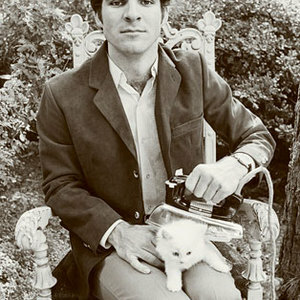 Steve Martin (born August 14, 1945 in Waco, Texas, United States) is a popular comedian, screenwriter, actor and musician. Martin was born in Texas, but raised in Garden Grove, California. Since his first notable entertainment job as a writer for the American sketch comedy show "The Smothers Brothers Comedy Hour" and his subsequent appearances on "Saturday Night Live", Martin has been one of the most famous comedians in the United States, especially during the mid-1970s. Martin has appeared in over 50 movies and between 1977 and 1981, released four best-selling comedy albums. Martin was born in Texas, but raised in Garden Grove, California. Since his first notable entertainment job as a writer for the American sketch comedy show "The Smothers Brothers Comedy Hour" and his subsequent appearances on "Saturday Night Live", Martin has been one of the most famous comedians in the United States, especially during the mid-1970s. Martin has appeared in over 50 movies and between 1977 and 1981, released four best-selling comedy albums. He is also a noted banjo player, and has received accolades for his talents. He has been awarded four Grammy awards, two (1978 and 1979) for his comedy albums and two (2001 and 2009) for bluegrass recordings. His most recent album, "The Crow: New Songs for the 5-String Banjo" won Best Bluegrass Album at the 52nd Grammy Awards in 2010 for music recorded in the 2009 award year.